FIRST CASUALTY: Dr Timoci Bavadra. There is a popular saying: truth liberates. Yet thousands of people, privy to vital information about one or other of Fiji’s coups, refuse to liberate us with the truth, even after they “see the light”. This “self-censorship” is far more invidious than the draconian media censorship practiced by the Military Regime. None of Fiji’s leaders of major political parties, the army, religious and non-government organizations, have ever revealed the truth about their roles in any of the coups or attempted coups of 1987 (two), 2000 (how many? ), 2006 (one) or 2009 (one). Thousands of senior civilians in the corporate sector, the professions (especially the lawyers and senior accountants) and NGOs have known who exactly were behind one or the other of the coups, but no one has publicly revealed what they know. Despite numerous public calls over the last twenty years for a Commission of Truth (and Reconciliation), no government, legal or illegal, has even talked of establishing one while all claim transparency and accountability. For a small country where the “coconut wireless” is supposed to reveal everything, it is astonishing that every single coup has been accompanied by what can only be described as massive “conspiracies of silence”. These conspiracies of silence encourage many “good” citizens, former citizens, and even non-citizens to continue to support the illegal Regime of Frank Bainimarama. They allow Military Regime collaborators like Winston Thompson (the Regime’s Ambassador to Washington), Peter Thompson (Regime’s Representative to UN) and other Bainimarama supporters (like Croz Walsh, Thakur Ranjit Singh, and Graham Davis) to spread the Regime’s propaganda to the world about his alleged desire for racial equality and electoral reform. They encourage opponents of the Military Regimes into tunnel vision attacks targeting prominent Regime drivers (like Bainimarama and Khaiyum) while ignoring the supporters in the shadows, without whom none of these coups would have succeeded to the extent they have. Most important for us today, these conspiracies of silence prevent current pro-democracy movements from getting the support they deserve- because of distrust by the general public (Fijians, Indo-Fijians and others). These cancerous conspiracies of silence prevent genuine reconciliation based on truth and repentance, which is the only solid foundation on which pro-democracy people can build a better Fiji. The pro-democracy organizations must ask themselves: why do their meetings draw very few people, despite the obvious illegality of the Bainimarama Regime in Fiji and the great damage they are doing to Fiji? It is not that our people in Fiji and abroad, don’t care. But many probably ask the same questions I do. Do the organisations which these movements want to link to (like SDL, FLP, the Methodist Church and some trade unionists) genuinely believe in democracy and law and order, when all evidence suggests they have actively supported one coup or another and none have publicly acknowledged their past errors? Pro-democracy movements must not only criticize the Bainimarama coups of 2006 and 2009, but also establish the truth of the 1987 and 2000 coups, whose evils live on today in the Bainimarama coups, with many common names and beneficiaries involved with all of Fiji’s coups. Twenty four years later, the historians are still struggling to piece the bits together, with many missing links: who were all the real planners of the 1987 coup that deposed the NFP/FLP Coalition Government with indigenous Fijian, Bavadra, as Prime Minister? The media revealed the names of many prominent persons who attended the taukei nationalist meetings in Nabua and elsewhere: Ratu Finau Mara, Filipe Bole, Adi Finau Tabakaucoro, Ratu Inoke Kubuabola, and others, many now deceased, but many who also support the Bainimarama Regime. 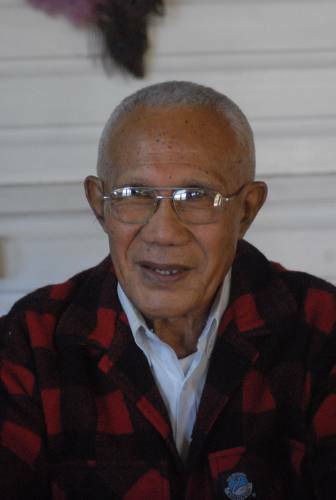 While Rabuka (only third in the army) implemented the coup, historians still conjecture about the knowledge of the Army Commander then (and illegal President today), Ratu Epeli Nailatikau- son-in-law of Ratu Kamisese Mara and brother-in-law of Ratu Tevita Mara (now a bitter critic of Bainimarama). Why had Nailitakau gone overseas during a time of unprecedented turmoil in Fiji, merely to “receive” a small naval boat donated by Australia? Silence. 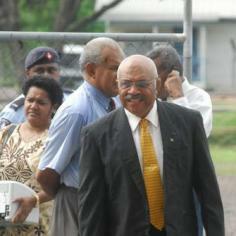 Recent statements by Rabuka implicate Ratu Kamisese Mara, but would his son-in-law Commander not also have known? Ratu Penaia Ganilau (then Governor General) also readily collaborated by becoming President of the Republic after the second coup. Did he also know before hand? It is well-known that each of the Three Big Chiefs of Fiji (Mara, Ganilau and Cakobau) had their own “special senior men” from their confederacies in the army, maintaining their own political balances. Most of these officers (some recently sidelined by Bainimarama), actively supported that 1987 coup and benefited personally. Whatever may be furtively said around the grog bowls, no senior military person or senior citizen in the know has ever revealed who were involved in that 1987 coup. Historians have established that the justifying ideologies were of indigenous Fijian political supremacy and of democracy being a “foreign flower” for Fiji. 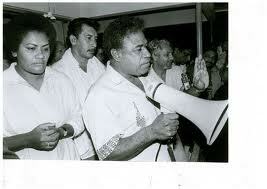 These ideologies surfaced again in 2000 with an additional one that Indo-Fijians should never be Prime Ministers of Fiji (although in 1987, when there was an indigenous Fijian Prime Minister, Jai Ram Reddy was accused of being the “gun” firing the “Bavadra bullet” against the Fijians. How many hundreds of senior people in Fiji knew about the 2000 coup planners? Many in the SVT who lost power in the 1999 Election had expressed open support for the Taukei ethno-nationalist movements against the Chaudhry Government. I belatedly realized the significance of a large group of prominent people meeting, just prior to the 2000 coup, at a neighbor’s house, frequented by former Levuka Public School students and their grog gangs. Some in this group hinted that qualified individuals would be called upon to provide alternative leadership in Fiji, and very late one night, a singer on the stage was pointed out as the future Prime Minister of Fiji. The same grog gang would months later joke that the individual in question was about to be sworn in as part of Speight’s government, but received a call from his brother “Get the hell out of there, the army is no longer with you”. The joke went that the individual supposedly told the Speight group that he was going home to freshen up, but never returned (and thereby later missed out on the free accommodation offered at Naboro). If these indirect signs of a bigger conspiracy were being observed by someone only on the periphery, how many people must know much more about the solid facts on the planning of the 2000 coup, and are not telling? Only recently, ten years later (but better late than never), has Ratu Tevita Mara alleged that Bainimarama supported the 2000 coup, and that after the Chaudhry Government was taken hostage in 2000, arms were freely going from the RFMF armory into Parliament, with the permission of Bainimarama and full knowledge of many senior officers. So did senior army officers then like Frank Tarakinikini, Jone Baledrokadroka, Viliami Seruvakoula, George Kadavulevu, Naivalarua and many others, know what was going on? If so, how is it that all these army officers, even the ones working safely for UN organisations or are at universities abroad, have maintained a blanket silence about the real army plotters of the 2000 coup and their corporate supporters. Indeed, who were the corporate supporters of each of these coups (as there always are)? How long will the public have to wait while Ratu Tevita Mara (guided by unknown advisers) releases in dribs and drabs, the important bits of information that are in the Report of the Evans Board of Inquiry into the role of the CRW soldiers and the takeover of parliament? Any why the dribs and drabs? Are they hoping to get more political mileage or are they going to be selective about what they release as “Truth for Fiji”, to protect certain individuals? This is a bad strategy all around, creating yet another conspiracy of silence around Ratu Tevita Mara undermining his reputation. This issue is of great relevance today because many Bainimarama supporters think that he is genuinely multiracial and wants to protect minority Indo-Fijians from dominance by the indigenous majority. The facts are that in 2000, when Bainimarama finally arrested Speight, Nata and Silatolu, he did not re-instate Mahendra Chaudhry’s 1999 government but installed Lai Qarase as Interim Prime Minister. The Interim Administration also included individuals such as Ratu Yavala Kubuabola (former SVT Finance Minister), Ratu Inoke Kubuabola (former Leader of SVT), and Ratu Epeli Nailitikau. 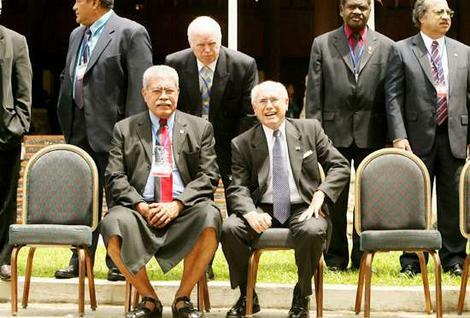 Bainimarama, Rabuka and Ratu Epeli Ganilau instead of protecting their President against the Speight rabble (their sworn duty), broke their oaths and told Ratu Mara to “step aside” as President. Where in the world do army officers ask their President to “step aside” so they can just deal with a rabble group that takes over one building? Why did they do so, and on whose agenda? Silence. How relevant is it to understanding the 2006 coup, that Bainimarama soon after the 2000 coup, had readily announced that he had abrogated the 1997 Constitution and began to pass Military Decrees. And how important was the lesson give by the Tony Gates judgment in the Chandrika Prasad case, that the 1997 Constitution could not be abrogated by the army commander, and was still intact. How relevant is it to Bainimarama’s claim to protect Indo-Fijian minorities that when he regained control, Bainimarama did not re-install the Chaudhry Government but Qarase’s Interim Regime, comprising mostly indigenous Fijian former SVT Ministers? Eventually when the newly formed SDL Party in coalition with the extremist Conservative Alliance, thrashed the SVT (and the FLP narrowly) to win the 2001 elections, Qarase appointed Ratu Inoke Kubuabola (the former leader of the SVT), as Ambassador. Why would he do this when there were so many others vying from his own party? No one is saying. Six years later, the allegedly multiracial Bainimarama also included Ratu Inoke Kubuabola and Isikeli Mataitoga, two staunch ethno nationalists, in his post-2006 coup Regime. Why these two, when he had had so many to choose from? Silence. Why the Bainimarama and Qarase “fall out”? There is yet another conspiracy of silence about the falling out between Bainimarama and Qarase. The obvious factor appeared to be the CRW mutiny and attempted assassination of Bainimarama (a traumatic event for any Commander of a military force), and Qarase’s release from jail of persons convicted of supporting the 2000 mutiny, and their re-appointment to top positions in the Qarase government. But why did the CRW soldiers mutiny? What truth is there in the allegations by Ratu Tevita Mara that the CRW soldiers turned on Bainimarama because he did not keep his promises to the soldiers who did the coup allegedly at his instigation? Qarase is on record as asserting that democracy was a foreign flower and that Fiji was not ready for an Indo-Fijian prime minister so he would not have lost any tears over the 2000 coup. But was Qarase also favorably disposed towards those who attempted the mutiny against Bainimarama? What was the role of the Methodist Church in brokering the agreements after the 2000 coup and were there any “understandings or agreements” between Bainimarama, Qarase and the Methodist Church, which fell apart eventually? Silence from all concerned. No one in the know is prepared to break the conspiracy of silence, not even the close advisers and ministerial colleagues of all the past Prime Ministers. One wily individual, close adviser to many Fiji Prime Ministers, must be a gold-mine of inside information (on some of which he would have to plead the US Constitution’s Fifth Amendment). But he is not telling anything, while cocooned currently at one of the Fiji universities. Nevertheless, it is sufficiently clear from statements by former Military Officers (on the website Truth for Fiji run by Ratu Tevita Mara) that Bainimarama had started planning to remove Qarase long before the Qoliqoli Bill or the Unity and Reconciliation Bill which initially had amnesty provisions for convicted people related to the 2000 coup. So how relevant were the police cases being prepared against Bainimarama for the deaths in custody of the CRW soldiers, or the surcharges for over-expenditure of the military budget, or his refusal also to allow the audit of the Regimental Funds (which allegedly have been abused by nearly all former Army Commanders), or eventually, Qarase’s attempt to remove him as Commander? If these possibilities have any substance, and if it is true that Bainimarama was in support of the 2000 coup against Chaudhry, would this change the views of many current Indo-Fijian supporters of Bainimarama, media outlets like Radio Tarana, or campaigners like Croz Walsh, Thakur Ranjit Singh, and Graham Davis? Or will they press on regardless, like Winston Thompson and Peter Thompson, neither of whom are fools when it comes to Fiji’s hidden politics but choose to look the other way? When Bainimarama did the 2006 coups, he heroically announced that he would eliminate all corruption and race-based politics from Fiji, stop the tyranny of the Indo-Fijian minority by the majority indigenous Fijians, end the coup culture, while making sure that no army personnel would benefit from the coup. Five years later, these allegations are now seen as completely hollow, or even blatant lies. All evidence suggests that there were great conspiracies at work, beginning with legal conspiracies. It is abundantly clear now that Bainimarama had learnt his legal lessons from Tony Gates’ High Court rejection of his attempted 2000 abrogation of the 1997 Constitution (where is Tony Gates now?). Immediately upon removing Qarase in 2006, Bainimarama suspended the Chief Justice Danial Fatiaki, and Judge Naz Shameem surprisingly illegally chaired the Commission which appointed Tony Gates as Acting Chief Justice. Gates’ contrived judgments then allowed the Bainimarama Regime to proceed with some semblance of “legality” for another three years, with a pliant elderly Iloilo in tow as President. Which judges and lawyers assisted Bainimarama with his legal strategies before the 2006 coup? Who are assisting Khaiyum in drafting all the Military Decrees? Silence in the court. In 2007, a newly appointed CEO of the Human Rights Commission, Shaista Shameem, weighed in with her flimsy pathetic justification for the 2006 treasonous removal of the Qarase government by Bainimarama, while she blithely ignored all abuse of human rights by the Bainimarama Regime. What was her role behind the scenes and in conspiracy with which lawyers and NGOs? Silence. Others who helped by speedily joining Bainimarama’s Regime were Mahendra Chaudhry and his Fiji Labour Party, and unsuccessful politicians from the National Alliance Party, including Filipe Bole and Ratu Epeli Ganilau (a former Army Commander who had supported Bainimarama’s appointment as Commander), Ratu Epeli Nailatikau (another former Military Commander), while lurking in the back-ground was yet another former FMF commander (Paul Manueli). With all these former FMF commanders either in Bainimarama’s Military Council or behind it, was it any wonder that the rank and file of the army remained totally in support of the 2006 coup (with lots of goodies thrown in for good measure), except for a few brave military officers who disagreed with the coup on principle, gave written advice and were soon expelled by Bainimarama. I later realized the significance of Filipe Bole coming to my home before the 2006 coup, to pick up education material that may have been useful for a future Minister of Education (thought there is little evidence that he benefited from the material). Who else in his party were involved? FLP stalwart, Lavenia Padarath vociferously campaigned that the 2001 and 2006 SDL victories had been through electoral fraud. Yet all evidence indicated that the votes cast were pretty well in proportion to population numbers for Fijians and Indo-Fijians, while Chaudhry despite his one year in the Military Regime, failed to reveal any real evidence of significant electoral fraud. Was it all just a red herring by the FLP to justify their support of the coup? Silence. Electoral system enthusiasts like Rev David Arms and “good governance” organisations like CCF (Yabaki, Dakuvula and associates) dubiously alleged that the existing voting system was racially biased against minorities and jumped in to help in the alleged electoral reform by the NCBBF. Of course the Alternative Vote system did have faults: it did marginalize small parties, but it was not particular ethnically biased. The supreme irony was that the Qarase-led SDL/FLP Government of 2006, formed under the requirements of the 1997 Constitution, was a genuine multi-party government. The SDL/FLP Cabinet did have expected teething problems over how cabinet decisions would be reached in a multi-party situation, and the necessity of adherence of all parties to the collective decisions whatever their individual views. But this provision of the 1997 Constitution genuinely protected the minority Indo-Fijian community, and in Qarase’s last government, offered substantial Ministerial positions to the Indo-Fijian party, all credit to Qarase. 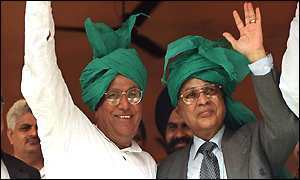 Yet Chaudhry ominously chose to remain out of the Cabinet, and paradoxically even tried to replace Mick Beddoes as Leader of the Opposition, while his own FLP colleagues were in Cabinet with Qarase. Why? There is silence from the FLP. Bainimarama supporters like Croz Walsh, Thakur Ranjit Singh and Graham Davis steadfastly ignore that it was this multi-racial multi-party SDL/FLP government that Bainimarama treasonously removed, not some allegedly ethno-nationalist and racist government of Qarase (however racist individual SDL Ministers may have been). Note also that the electoral reform discussions were completed by the NCBBF committee by the end of 2007 (yes, we all agree that a proportional system would be better). But David Arms and his committee (including CCF) have never publicly questioned why their work was put into “cold storage” for another five years. Why the silence from them today? Will they soon come jumping out of their storage boxes when Bainimarama or Khaiyum cracks the whip again? Critical intellectual support was given to the Military Regime by former ADB functionary John Samy, who together with the heads of the Catholic, Hindu, Muslim and other religious and Non-Government organisations (like CCF) began the grand Charter exercise through the National Council for Building a Better Fiji, essentially justifying the Bainimarama coup. Yet there was little in the final Charter document to differentiate it from the 1997 Constitution, while its first paragraph declared the supremacy of the 1997 Constitution. Taken by soldiers all over Fiji, the Co-Chair of NCBBF (Mataca) and Samy declared it had been supported by the vast majority of Fiji people. Yet Wikileaks evidence indicates that John Samy told the US Ambassador to Fiji, that he feared that there was intimidation. Many coup supporters stayed on long after Chaudhry was expelled in unknown circumstances and even after the clearly treasonous abrogation of the 1997 Constitution after the 2009 Court of Appeal judgment. They steadfastly maintain their conspiracy of silence, despite Bainimarama’s clear betrayal of their work for the NCBBF and the Charter. What did Mahendra Chaudhry and his FLP colleagues know about the planning of the 2006 coup? Was it merely a coincidence that the late Jokapeci Koroi (President of the Fiji Labour Party) had publicly called on Bainimaramama to remove Qarase from government? And Jokapeci Koroi’s sister (Dr Jiko) soon after jumped in as Minister? Despite being kicked out of the Regime and despite the muted criticisms that they make of Bainimarama today, Chaudhry and his FLP colleagues have remained totally silent about his expulsion from the Regime. There are other silences too, even on the current pro-democracy side. While Ratu Tevita Mara attacks Bainimarama and Khaiyum, he says nothing at all about the role of his brother-in-law, Ratu Epeli Nailatikau, whose treasonous acceptance of the President’s position is underlined by his monthly signing of the Public Emergency Regulations and the never-ending Decrees which take away our basic human rights of freedom of speech, freedom of assembly, freedom of association, and our fundamental rights to private property and lawful contracts. Ratu Tevita Mara also remains quiet about his other brother-in-law, Ratu Epeli Ganilau, who also readily joined the Military Regime, and was also later expelled by Bainimarama under unknown circumstances to do with proposed taxes on Fiji Water. Also maintaining their conspiracy of silence are pro-Bainimarama supporters who have withdrawn from public view, like Petero Mataca, Rishi Ram, Kamlesh Arya, Akuila Yabaki and Jone Dakuvula (the last two being key members of the now inappropriately named Citizens Constitutional Forum). Also silent about the past is Shaista Shameem who now fights legal battles for pensioners and unions whose basic human right are being viciously denied by the same Military monster she helped to create in 2006); and Naz Shameem who daily preaches about good governance and the need for whistle-blowers- but averts her eyes from the gross abuse of these principles by the Military Regime. The apologetic Yabaki now calls for international support for Bainimarama’s alleged plan to have elections in 2014 i.e. essentially accept treason and allow the mess to continue for another three years. Was the CCF one of the NGOs who Bainimarama claims supported his plan to carry out the 2006 coup? Another silence. Also remaining quiet are coup supporters like Father Kevin Barr, who is now publicly expressing disillusionment with Bainimarama, despite being forced by the media censorship in Fiji to express his unhappiness only on overseas media like Radio ABC and NZ, or on Croz Walsh’s blog. Barr still refuses to recognize that his worthy work for the Wages Council has been completely undermined by the fundamental and larger damage done to the economy and employers’ capacity to pay, by Bainimarama’s treasonous coup, and his illegal Regime’s policies and refusal to support his Wages Councils. John Samy may be disillusioned today with many of Bainimarama’s unaccountable and non-transparent actions which contradict the Charter. But he certainly is not revealing what took place just before the final abrogation of the 1997 Constitution in 2009. Currently, John Samy salves his conscience with band-aid work on a Fiji which is bleeding profusely from the many massive wounds inflicted by the Bainimarama Regime which he helped to strengthen between 2007 and 2009 with his Charter propaganda and other work behind the scenes we know nothing about. It is therefore evident that thousands of very intelligent and senior citizens of Fiji (and expatriates) have known detailed facts about the planning and implementation of one or other of the coups of 1987, 2000, 2006 and 2009, which the public still do not know. No coup leaders or collaborators have revealed their roles in the coups, or even publicly acknowledged their mistakes. It is understandable therefore that those who were victims of the 1987 and 2000 coups, have little sympathy for those who are currently opposing the Bainimarama Regime. Many genuinely doubt if the current pro-democracy movements against Bainimarama are really driven by principles, or merely because “their leader” and their interests are being harmed by Bainimarama. Of course, some coup victims enjoy the sight of past beneficiaries “getting their just deserts” (read the anonymous blogs). But many genuinely believe, helped by the conspiracy of silence over the 2000 events, that Bainimarama is fighting for racial equality in Fiji. So the vicious cycle continues, fed by all these cancerous conspiracies of silence. Sociologists and psychologists need to explore another strange but related phenomenon: the abject failure of Fiji’s senior citizens to publicly offer guidance to Fiji’s citizens, at a time when the country is in total disarray. How many senior citizens - from the corporate sector, religious, social, political, academia and even leadership organisations- have publicly come out in defense of our basic human rights so badly eroded today (Rev. Koroi is the brave swallow that does not make the summer!). Like Pontius Pilate they have either washed their hands off all responsibility, or actively collaborate with the Military Regime, to further their own personal interests. Some depart while maintaining their personal dignity while abdicating their duty and responsibility that comes with their social positions. Our senior citizens, through their silence, are allowing an entire young Fiji generation to grow up accepting the treasonous removal of a lawfully elected government, and the daily addressing and respectful treatment of an illegal Regime as “Honorable Prime Minister”, “Honorable Attorney General”, “Honorable Minister” and “His Excellency the President”. But why blame our ordinary powerless people when even ambassadors to Fiji, representatives of powerful international organisations (like IMF, World Bank and UN), vice chancellors of universities, and prominent corporate citizens do so as well, giving the naked emperors in Fiji the illusion that they are fully clothed. The conspiracies of silence also allow Bainimarama supporters like Croz Walsh, Graham Davis and Winston Thomson to keep repeating the dishonest Bainimarama/Khaiyum propaganda internationally, while deliberately ignoring all the evils which give the lie to Bainimarama’s “Charter” and alleged “Road-Map” (to nowhere). These cancerous conspiracies of silence undermine genuine reconciliation in Fiji and any attempt to build a genuine better Fiji; and they also prevent pro-democracy movements in Fiji and abroad from getting the support they deserve. Unchecked, cancers ultimately destroy the bodies they reside in. But don’t hold your breath for any miraculous cure to this cancer afflicting Fiji. The expected has happened - trade unionist Felix Anthony has been taken into custody by the illegal regime. Anthony (pictured) was arrested in Lautoka at quarter to four this afternoon. The secretary general of the Fiji Trade Union Congress is the second trade unionist to be taken into custody - FTUC president Daniel Urai was the first. Urai is yet to be charged but remains in custody. Anthony's arrest was signalled earlier today with reports saying police were talking to other people in connection to the earlier arrest of Urai. Under the PER, people can be held for several days before they are formally charged. The regime has today cliamed it will lift the PER when work starts on the new constitution and the 2014 election. A reprint of a letter by Rev. J. F. Koroi, the 81 year old former chaplin who told soldiers 'over my dead body' when they tried to take him to QEB during the height of the recent stand-off between the Methodist Church and regime after the church's permit to hold its annual conference was cancelled. I write with great concern, not only as a Minister of the Gospel of Jesus the Christ, but also as a fellow RFMF “Commissioned” officer to the Rank of Chaplaincy 3rd Class (Major) by His Excellency, the late Ratu Sir George Kadavulevu Cakobau, Governor General and Commander in Chief to the Fiji Infantry Regimental Forces, to remind Commodore F. Bainimarama and all other RFMF officers of the “common oath of allegiance” we all undertook regarding the Ordinance and Authorities of all other Powers which enabling the Commander-in-Chief, who in reposing especial trust and confidence in our loyalty, obedience, courage and good conduct did, thereby present, constitute, nominate and appoint each one of us to be an officer of the RFMF. Each one of us (officers) are therefore carefully and diligently ordered to discharge our various duties in the rank for which the officer is commissioned. 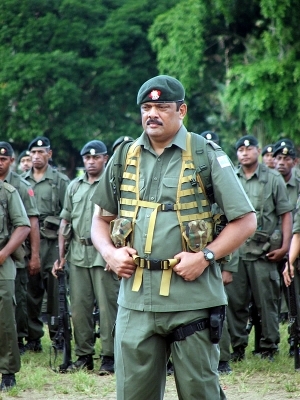 We are thereby commanded by His Excellency – the Commander-in-Chief to obey our superior officers and to observe and follow orders and directions as from time to time one shall receive from his or her superior officers according to the rules and discipline of war, and of the Military Forces of Fiji in pursuance of the trust thereby reposed upon us. 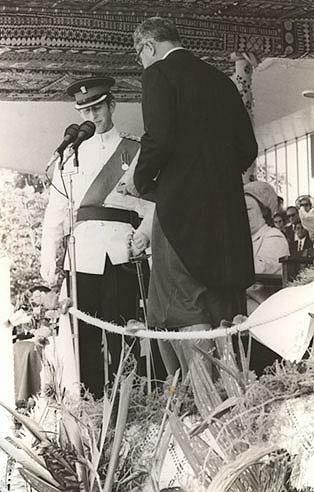 And being Commissioned for life for example, as a Senior Chaplain in the RFMF, who had 15 yrs service in the Military – both at home and abroad in peace keeping duties; I am morally obligated to plead for obedience and respect to the rule of law, and reconciliation in services between the Military and the Government - regarding the ongoing impasse, which now has brought to a stand still our most valued economic progression of tourism in the country. As for Commodore Bainimarama with his Commissioned officers with him, being antagonistic to the rule of law and order, and conspiring to march into the office of Prime Minister Qarase and force him to resign, and then take over the reign of his democratically elected government, they are “not only denying” their “oath of allegiance” to the supreme authority of the State and, or “abusing the trust of loyalty to duties” placed upon them, but they are deliberately conspiring to committing an act of “mutiny”, “treason” and a “felony” against the State and its democratically elected Government. But, at the moment, all are being caught up in political and military dilemma and power rivalry stalemate between them, and not knowing of where or whom to turn for a happy solution to the many serious problems that are threatening to the welfare, wellbeing, prosperity, security and peace in the country. I therefore would like to focus all attention to some words of divine wisdom from the scriptures, as moral guide to our character for good citizenship of a country. As we are trying to follow these divine directives from the Scriptures, let us bear in mind what the Apostle Paul said in addressing Christian citizens who were under the “Authoritarian” rule of the Roman Empire, and not a “democratically” elected government such as ours. Nevertheless, both types of Government are founded on the same moral and spiritual principle of righteousness, obedience, justice, and truth. All Christian citizens, as St. Paul said to Titus (3:1-2) are “to be subject to principalities and powers, to obey magistrates, to be ready to every good work, to speak evil of no one, not to be aggressive, to be kindly, to show all gentleness to all people”. And again St. Paul continued to tell the Christians in Rome to ---“Render due obedience to those who occupy positions of outstanding authority, for there is no authority which is not allotted its place by God, for the authorities which exist have been set in their place by God. So, he who sets himself up against authority has really set himself up against God’s arrangement of things ………” said the Apostle Paul (Rom 13:1-7). The above passages are to counsel “absolute obedience” on the part of the Christian citizen to the civil power. As a general rule, God “condemns” civil disobedience toward the lawfully – existent government. Those who are contrary and rebel against it, must know that opposition to government is opposition to God. However, the obedience which the citizen owes to the government is never absolute and must be carefully weighed in the light of his subjection to God. To unlawfully and unethically resist government, as the Commander RFMF has been doing, brings the judgement (not condemnation) of God upon the people of the country. Since God’s purpose in ordaining government of the day is to “restrain” wickedness and “promote” virtue, we are to be in subjection to any government, which fulfils this purpose. The Ministers of the State are ordained of God to minister that, which is good. Therefore the town Mayor or a Police or an Army Officer, or a Village chief is as much a minister of God as the local pastor of the church, but in a very different way. We ought to have as much respect for good mayor or government minister as we do for a good priest of Hindu temple, Mosque or a Church. The hands of good government should never be so tied, that they cannot execute good judgement and the wrath of courts of law upon those who do wrong and evil things. However, at this point, the Apostle Paul, reiterates God’s general rule that we need to be subject to the higher powers, but he introduces also the question of the “conscience” as well. The Christian citizen always lives in a tension between the “two” competing claims of “obedience” to the “State” and “obedience” to “God”. The State has the right to demand our respect and conformity. Thus, we are to be in subjection to those in authority over us, not only out of fear and respect but also out of “good conscience” before God. However, the “morally conscientious” dare not “blindly” bow to the State if his conscience is offended by the wickedness of the State. There may be times when “we ought to obey God rather than men”. (Acts 5:29; cf 4:9). Since the “State” and its “magistrate” are “not infallible”, the moral objector may at times have to conscientiously object to what the State requires is in direct contradiction to the divine law of God. To be a good citizen of the State we must as St. Paul said, “render …. To all their dues”, that is to discharge our obligation to all citizens. If we disobey the State, we are to fear, concern, and reverence those who have been charged with responsibility of punishing disobedience and the rebellious. At the same time we are to respect the laws of the State and those who make the laws. It is dishonourable of anyone to speak in a disrespectful way of the State or officers of the State and as well as our own local leaders. OBEDIENCE AND RELATIONSHIP TO POWER AND AUTHORITY. Truly, here, with this passage, there is laid down the duty of all good citizens; and its advice is particularly relevant to the turmoil situation facing the Fiji Military and the Government authorities. The RFMF Commander, Commodore F. Bainimarama and officers have, for sometime now been notoriously turbulent and quarrelsome and as well as impatient of all government authority, particularly in regards to the proposed R.T.U. and Qoliqoli Bills. This passage lays down six qualifications for the “good reputable and desirable” moral character of a citizen. (1) The good citizen is “law abiding”. He or she recognises that unless the laws are kept, life becomes chaos. He or she gives proper respect to those who are set in authority, and carries out whatever command is given to him. Christianity does not insist that a man should cease to be an individual, but it does insist that that, he must always remember that he is also a member of a group. As someone, once said: “Man is a political animal”. And what it means is that, a man best expresses his personality not in isolated individualism, but within the framework of the group. A good citizen best finds him/herself in the company and the service of others. (2) A good citizen is “active in service”. He or she is ready for every work, so long as it is good. The characteristic modern disease is “boredom”; and “boredom” is the direct result of “selfishness”. So long as a person lives by the principle of “self importance” and “self aggrandizement” – whose only desire is to be served rather than giving service for others, is bound to be bored and stressed. Is it not this the kind of “boredom” the RFMF and its Commander suffers? 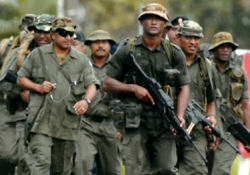 As it has been for some years now, since the withdrawal of the Military guards personnel from all government services and its Prime Minister; and have shifted all services to themselves by providing heavy security, only for its own Q.E Camp and to the seemingly most insecure person in the country – Commodore F. Bainimarama – to whom the government has entrusted all weaponry ammunition for the purpose of providing national security and stability, but who has failed miserably because he suffers from the dreadful moral disease of “boredom” – as a direct result of “lack of active service” for others, and of selfishness and self aggrandizement. (3) A good citizen is “careful in speech”. He or she must slander no one. No person should say about other people what he or she would not like other people to say about him or her. The good citizen will be as careful of the words he speaks as of the deeds he or she does. It may be true to think that, there would not be another military “coup” as pronounced by the RFMF spokesperson Major. Leweni; but the “Slandering words” that have been uttered about the Government and its officers by the Commander, Commodore F. Bainimarama has had already its same destructive effect, if not worse, on good relationship that existed – politically, economically, socially and morally both, nationally and internationally between Governments, with all the citizens and allies. (4) The good citizen is “tolerant”. The word “tolerant” in Greek means – not a fighter”. He or she is “not aggressive”. This does not mean that the good citizen will not stand for the principles which he or she believes to be right, but it does mean that he will never be opinionated that he cannot believe that any other way than his or her own is right. He will allow to others the same right to have their convictions as he or she claims for him/herself to have his own. The call by Commodore F. Bainimarama for the Government to resign if it would not drop the so called “unjust” policies such as the R.A.T.U and the Qoliqoli Bills; - can only be best described as aggressive, unconstitutional, immoral and intolerably unacceptable. (5) A good citizen is “kind”. The word “kind” describes the person who does not stand upon the letter of the law. It denotes “indulgent consideration of human infirmities”, it also denotes the “ability” to consider not only the letter of the law, but also the “mind” and “intention” of the “legislator”. The person who is kind is ever ready to temper justice with mercy, and to avoid the injustice, which often lies in being “strictly” just. Is it not this, the justice with mercy which the “R.T.U and Qoliqoli Bills” is trying to bring in with the Landowners in order to avoid the “injustice” which lies in being “strictly just” as advocated by the RFMF Commander F. Bainimarama, with his policy of “retaliation” which is “an eye for an eye and a tooth for a tooth”. This opposes the Christian principle of “forgiveness and reconciliation” which is not the resisting of evil with evil: but, “whoever smacks you on the right cheek, turn to him the other also” said Jesus. Jesus is here telling the Christian believers how they should respond to personal injury. He is not discussing the government’s obligation to maintain law and order. Although, the question of non-retaliation or non-violence is often discussed in relation to these verses, however these passages alone do not mean that a person should not defend his family or his country, but rather that he should not attempt personal vengeance as Commodore Bainimarama is now doing, even through the means of the law, to compensate for a personal injury. The reason for this “non-retaliation” or “non-violence” of Christian principle is that – all justice ultimately is in the hand and heart of God. As long as human governments prevail, justice will be limited by people’s finite abilities. The practical application of this principle is that the Christian citizen should not attempt to justify him or herself or inflict vengeance, even through legal means. He is to place his total confidence in the ultimate sovereignty of God over the affairs of his life. This Christian principle “to overcome evil with good” (Rom 12:21) is probably the “most feared statements in all the Bible”. People have gone to great lengths in an attempt to explain it away. But still, it remains the most pungent statement of Christian ethic. The life of a Christian citizen in society is to be lived with such a quality of moral verity and justice that he needs “no physical retaliation” in order to defend or justify his position. This pungent statement of ethics should speak directly to the minds and hearts of Commodore Bainimarama and his armed soldiers that they “must not” continually bully the innocent general public with “guns”, and stop the takeover threat and their clean up campaign by force of our democratically elected government of Fiji. (6) The good citizen is “gentle”. The word describes the person whose temper is always under complete control. “Gentle” usually refers to our outward conduct while “meekness” to our inward attitude. It describes the person who knows when to be angry and when not to be angry, the person who patiently bears wrong done to himself, but is ever ready to spring to the help of others who are wronged or injured. If such a high moral standard of conduct is required for a good “gentle” leadership in good citizenship, who of the two gentlemen Mr. F. Bainimarama or Mr. L. Qarase, in your own personal understanding of their attitude and character is best suited to the moral quality of leadership for the good and “gentle” governance of our country? What duties are expected of a Christian for good citizenship? Nothing is further from the thought of all the Apostles and Christ than any kind of anarchy. Jesus had said, “Render unto Caesar the things which are Caesar’s; and unto God the things that are God’s (Matt 22:21). The Apostle Paul was certain that those who governed the nation were sent by God and held their responsibility from God, and that they were no terror or threat to the person who lived an honourable life (Rm. 13:1-7). St. Paul had instructed all Christians to pray for Kings and for all that are in authority (1 Tim.2:2). The instruction of these Apostles is that the “Christian” must be “good” and “useful” and “faithful” citizen of the country in which his or her life is set. All societies are built by people who join themselves together and agree to live under certain laws, in order that not only the good and the honourable people, but all common citizens as well may have peace, to live their lives, to do their work, and to go about their business, and in order that the evil people should be restrained and controlled and kept from their evil doing. The whole idea of these Apostles (Paul and Peter) is that life is meant by God to be an “ordered business”, and that the “state” is divinely appointed to provide and to maintain that order. This point of view, expressed by these Apostles, is perfect and “just” and “logical”. Paul and Peter holds that a person cannot accept the privileges, which the State provides him or her without also accepting the responsibilities and the duties which the State demands from him or her. A person cannot in honour and decency, take everything and give nothing. HOW ARE WE TO TRANSLATE THIS CONCEPT INTO OUR SOCIO – POLITICAL, AND SOCIO – RELIGIOUS SITUATION TODAY? It is understood that there is a fundamental difference between the State in Paul and Peter’s time and the State we know today. In the Apostle’s times “State” was “authoritarian”. The “ruler” was an “absolute” power and the sole duty of the citizen was to render “absolute” obedience to the State and to pay taxes as the State ordained (Rom. 13:6-6). Under these conditions the “keynote” was bound to “subjection” to the State. We no longer live in an “authoritarian” State, but we now live in a “democracy”; and, in a democracy something far more than unquestioning “subjection” and “submission” becomes necessary. In a democracy, Government is not only government “of” the people; is also government “for” the people and “by” the people. Now the demands of both Apostles (Paul and Peter) is that the Christian citizen should fulfil their responsibility and obligation to the State. In the “authoritarian” State, that obligation consisted solely in “submission and subjection”. But what is that obligation in the very different circumstances of a democracy? Or to ask the question in another way if “subjection” is the “keynote” of the obligation of the citizen in the authoritarian State, what is the “keynote” of the obligation of the citizen in the “democratic” State? While it is true in any State, there must be a certain subjection, there also must be “a voluntary subordination of oneself to others, putting the interest and welfare of others above one’s own, preferring to “give” rather than “to get”, to “serve” rather than to “be served”. But in a “democratic State”, the keynote must not be “subjection”, but “co-operation”, for in the democratic State the duty of the citizen is not only to submit to be ruled, but to “take the necessary share” in ruling. Therefore, if the citizen is to fulfil his duty to the State, he must take his part in the government of the State; that is, he must take his part in the local government of the city, the town, the district, the province, the village and the community where he stays. He must also take his part in the life and work and administration of the trade union, business Company or association connected with his trade, craft or profession. “No one” can, entirely disassociate himself from a democratic society in which he lives and has a part”. No one can, in conscience, opt out of the nation; not even Commodore F. Bainimarama with his tons of bullets dubiously confiscated from the Customs at the Suva wharf. Each of the Military personnel is a part of the body of the state, and enjoys benefits which he could not as an individual. He cannot reasonably claim all the privileges and then refuse all the duties and responsibilities. He is bound up in the bundle of life as he is part of the body of the military, just as is a policeman, a member of a political party, a town councillor etc. And he is also a part of the State which calls for his loyalty and co-operation. There is no such thing in this world as an independent isolated individual. A person has a duty to the state, and must discharge that duty even if he be a Dictator such as Emperor Nero of Rome or Commodore Bainimarama, who is threatening to be one. It is to the democratic State government that a person owes his protection. The State exists for the sake of justice and safety; personal security against violence, savagery and calamity. A State is essentially a body of people who band themselves, co-operate and covenant together to maintain certain relationships between each other by the observance of certain laws and policies. Without the State, or without these laws, and without the mutual agreement and co-operation to observe them, the antagonist, the selfish and the out of control militant man, such as Commander Bainimarama, would be supreme. The weak, the innocent, the begging to be different in the general population, would go hiding behind walls. Life would become ruled by the law of the jungle. Every ordinary person owes his security to the State, and is therefore under a duty and responsibility to it. Ordinary people benefit from a wide range of state provided services which individually they could not attain to. It would be impossible for every person (especially the state paid Fiji Military Forces) to have his own water, lighting, sewage and transportation system, etc. It would be impossible for a person by himself to enjoy a system of municipal services, communication, social security, health and education, etc. These things are only obtainable when people agree and co-operate to live together. It would be quite wrong for a person to enjoy every thing wherewith the State provides him and refuse all responsibility to that State. No person in all fairness takes everything and gives nothing. That in fact, is one compelling reason why the individual person is bound in honour to be a good citizen, and to take his part in all the duties of citizenship. It was St. Paul’s main views that “Governments are Divinely Ordained To Save The World From Chaos”. The Apostle Paul, as he saw things of his day, believed that the Roman Empire was the divinely ordained instruments to save the world from chaos. Take away that Empire, as St. Paul saw it, and the world would disintegrate into flying fragments. It was in fact, the Roman State, which gave the individual citizen the chance to do his work (Christian missionaries included). Ideally people should be bound and co-operate together by the love of one’s own country; but they are not; and the only ultimate bond which keeps them together is the rule of law of the State. The Apostle Paul saw in the State an instrument in the hand of God; the state preserved the world from chaos; those who minister the State are playing their part in that great task. Whether they know it or not they are doing God’s work, and it is the duty of every citizen not to hinder, but rather to co-operate and positively assist. And lastly, but not least, Paul said that all citizens have a higher obligation than even his obligation to the State. While he must render to Caesar the things which are Caesar’s, he must also render to God the things that are God’s. These are perilous times for our small nation and I call upon all to ponder earnestly and consider the path of lawful righteousness, truth, integrity and peace! !